User stories are grouped into a logical, time-boxed iteration call sprint. You will learn how to add a sprint in this article. Enter the name of the sprint and press Enter. You are instantly brought to the screen where you can add user stories into the creating sprint. 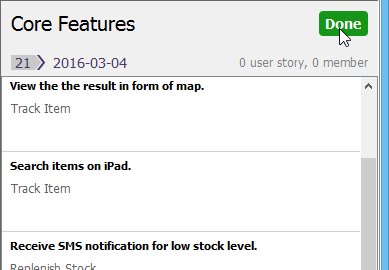 To add a user story into the sprint, scroll through the page to locate the story. Then, press on it and drag it to the list on the right hand side to add it into the sprint. If you want to add multiple stories into the sprint, check them and click Add checked user stories to sprint. Click Done at the top of the list on the right hand side.